0.3 3. Fatboy Lamzac The Original! Air loungers are the furniture of the future. When you’re headed to the beach or just your backyard, don’t bring your old lawn chair. You can do so much better than that! Lounge in one of these inflatable dream chairs instead. What is an air lounger? Think of it like an air mattress in the shape of a canoe. But you don’t need an air pump to inflate it. They are typically made of ripstop nylon on the outside with an airtight plastic liner on the inside. You can even enjoy them as a pool float. 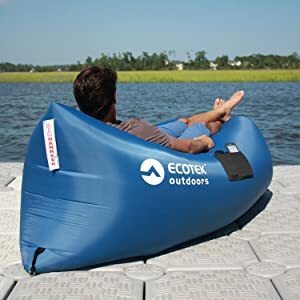 These self-inflatable air lounges are super comfortable, easy to transport, and simple to set up. You may have already seen them at outdoor events because they are instant furniture for one, two, or even three people at a time. Let’s take a closer look at the five best inflatable lounge bags. ChillaX ensures that all your needs are covered with their inflatable lounger. They don’t want you worrying about anything while you’re relaxing and so they ensure you that your purchase is risk free. You can replace your lounger or get a full refund if you’re not satisfied without interrogation from customer service. 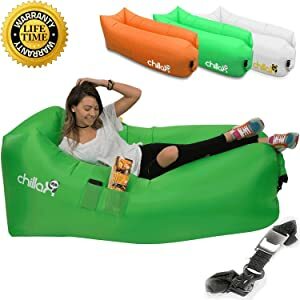 The first thing to know about the ChillaX Inflatable Lounger is that it may be different from some other brands that you’ve seen. ChillaX has designed their lounger with two separate cells that you will fill with air. Don’t be fooled into thinking that this will take more effort on your part. Having two separate chambers, means that each chamber requires less air than one big chamber, so you will exert less energy to get it filled! Once you’ve filled it up, you’ll find 3 pockets on the side to hold your stuff while you lounge. There are specific pockets for your phone, a drink, and even the book you’re currently reading. Take your relaxation session wherever you please. Whether you want to relax in your backyard, on the beach, or even in your pool, ChillaX has you covered. With a comfortable headrest you might even find yourself taking a quick nap. 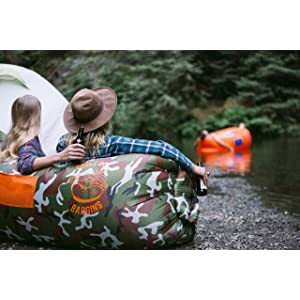 The Vansky 2.0 Inflatable Lounger claims to be more durable than other loungers leading to even more relaxation for you. The Vansky team makes sure that the sewing on their loungers is impeccable and designed to support up to 500 pounds without tearing after a couple of uses. 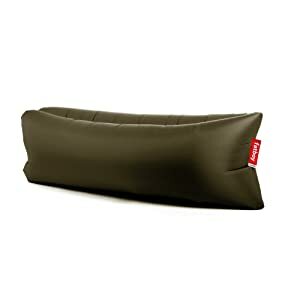 If you look at the carry-bag that stores the Vansky 2.0 Inflatable Lounger, you would never guess that such a sleek and strong product could be folded inside. The compact size that Vansky’s lounger folds down to makes it an easy option for exploring and traveling. If it’s a windy day, you’ll inflate your lounger in 10 seconds, maybe even less! But don’t worry, you won’t find it difficult even if there isn’t much wind. It’s two separate air shafts make inflation simple and painless. Convenience isn’t a question with Vansky. Whether you’re floating in your pool or relaxing by a campfire, you’ll have comfortable head support and easy access to the things of your choice. Try keeping your cell phone, drinks, and snacks in the lounger’s side pockets. You can spend all day resting on your lounger if you want since it stays inflated for up to 8 hours at a time. Either way, when you’re ready to put it away, just let the air out, fold it up, and put it back in its carry bag! 3. Fatboy Lamzac The Original! If you’re interested in an inflatable couch that’s as sleek looking as it is comfortable, then Fatboy Lazmac the Original is the one for you. You can choose between a few warm and bright solid colors depending on your preference. Inflating the Fatboy is just as easy as any other lounger and once it’s inflated, it can hold up to 440 pounds. 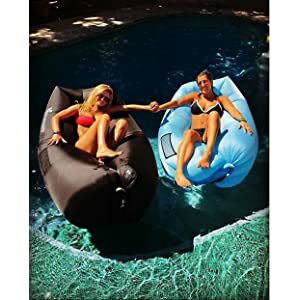 This means you and a friend can relax together, or it can be used by a group of children playing in the pool. Don’t worry about this lounger accumulating wear and tear whether you use it inside or outside. It repels both moisture and dirt. And for extra insurance, it is simple to clean with just a towel and some water. You can store your Fatboy lounger wherever best suits you. Once you deflate it, you can store it in its carry bag and its total weight is just 2.6 pounds. HAKE takes their stab at producing the ideal inflatable lounger by targeting the shape, which they claim is superior to other loungers. Their lounger is wider than most others which will likely enhance your comfort. Whether you want a chair or a longer couch style lounger, HAKE will take care of you. 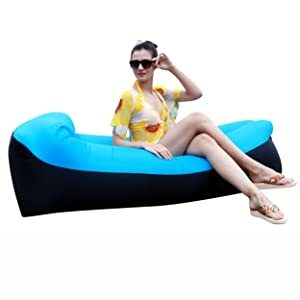 Their lounger inflates just like other loungers by filling it with air. You can control how much air you want to fill your lounger with depending on if you want a chair or couch experience. With a selection of two tone and pattern loungers, you will be able to express your personality while relaxing in whatever situation suits you. With HAKE’s U-shaped headrest, you will feel like you have a real pillow behind you and might even find yourself drifting off to sleep. One thing is for sure, with up to 6 hours of inflation, you will be able to spend some time fully relaxed on HAKE’s lounger. And push your worries aside. Any problems you experience with your lounger will be addressed and solved by HAKE’s customer service and repair facility. Gaduge based their Beach Lounger on the designs of the Lamzac Hangout and the Kaisr bag. It’s basically a mega-size “drybag” like canoeists and kayakers use. The exterior shell is polyethylene like a parachute. The interior is a tough plastic bag that holds the air. Instead of keeping valuables safe from getting wet, it keeps air from getting out. Although it weighs just 2.43 pounds, it can support up to 400 pounds of weight. Two or three adults can sit on it at one time, side by side like a sofa. The semi-rigid plastic inserts help the lounger maintain its classic canoe-like shape. That shape feels a lot like a cozy hammock. Plus, this second gen hangout has mesh pockets on the side to hold a tablet, book, or phones. Many customers have discovered that the Gadugelounger holds air for about 4 hours before it needs to be re-inflated. The amount of time seems to vary depending on the weather and the amount of weight it’s holding. To fill it, open the tube and swing it through the air. It helps if it’s a windy day. If you fill it indoors, use a fan for quicker setup. Once it’s inflated to your liking, roll the end like a bag of chips four or five times and clip it. Of course, the manufacturer recommends avoiding sharp rocks. Although the bag is pretty tough, it’s not impervious to punctures. You can use it in the pool, but don’t depend on it as a lifesaving device. It has a tendency to to tip over. When you’re done using the dream chair (don’t you just love that name? ), unclip it, let out the air, and fold it up. It measures about 4.1 by 10 by 14.2 inches when it’s compressed and fits nicely in the included carrying sack. If Frodo and Sam had these Chillbo Baggins Lounge Bags, the Orcs would have been after them for more than just the Ring. But compared to all the other air loungers, what makes this brand different? For one, they have a large side pocket that’s also made of nylon, not mesh, so it’s a little more protection for your stuff. There’s an elastic loop to hold down your lounger. There’s only one opening, not two, to fill with air. Their color selection includes camouflage. And they offer a 100% satisfaction money-back guarantee. Yes, you can float down the Great River to Gondor on the Chillbo Baggins Lounge Bag. It holds up to 400 pounds but weighs only 3 pounds itself. It comes with its own carrying sack with shoulder strap. EcoTek calls their lounge an air hammock, an apt name since you’ll be lying in comfort upon it. They strive to differentiate their product from all the others with higher-quality materials and a 1-year warranty. Instead of simple ripstop nylon with a plastic bag liner, Ecotek uses 210-thread-count nylon backed by polyurethane for the exterior shell. The interior liner is plastic and replaceable. Owners have commented that the side-locking closure buckle is strong and does a great job at preventing air leaks. When inflated, the EcoTek is over 6-feet long and it supports over 400 pounds. It’s stable enough to hold two or three adults, or let one person enjoy floating in the water. There are three strong elastic pockets for a drink bottle, phone, and tablet. Like all the other air loungers, this one needs to be inflated by scooping up air. Even without a breeze to help, it takes a minute or less to fill. Roll the ends closed, clip it shut, and secure it down with the included aluminum alloy stake. If you have any doubts, they have illustrated instructions included in the box. When you’re done enjoying the air hammock, unclip it, let out the air, and fold it down to a compact 10 by 15 inches. It fits into the included carrying bag. You can rest easy knowing that EcoTek funds the planting of a tree in a US National Forest each time they sell an Air Hammock. Since air loungers only started appearing on the market in 2014, they are still a relatively new product. Here are some of the most common questions people have about them. Q: How do you inflate an air lounge? A: Here is a video made by someone who understands the technique. Many videos jokingly show people swinging the bag around and around or running back and forth. None of that is necessary. Watch closely to see how she makes it work in a small space. Part of her trick is to scoop the air, then quickly shut the bag, then scoop again. Q: What happens if you rip or puncture an air chair and it leaks? A: First, find the leak and assess how big it is. Some manufacturers have repair kits for sale. EcoTek has a replaceable liner. You can often use nylon repair tape made for a tent to patch the hole. Then there’s always duct tape. Q: How do I clean my air lounger? A: Usually a damp cloth and mild soap will do the trick. Check to see if your bag’s manufacturer has advice on how to care for their product. Just make sure it’s completely dry before you store it. Q: How do I pick the right air hammock for me? A:It depends on what you want the most. We’re going to cover that right now in the “Recommendations” section just below. How do you plan to use your air lounger? Will you take it camping, to a concert in the park, to the beach? Will you want to float in a pool or a lake? Will you use it often or just once in a while? Those are all questions to ask yourself before you buy. Price is always a consideration, but you do get what you pay for. If you plan to use your air hammock frequently on all sorts of terrain, opt for a higher-quality, tougher one like the EcoTek. 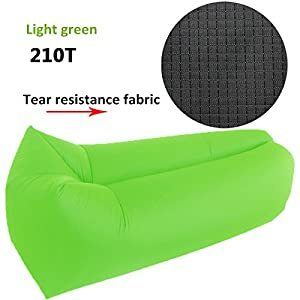 If you want one for light use in the house, the backyard, or other gentle environments, get one of the lighter-quality lounges like the Gaduge, ChillaX, or the Chillbo Baggins or other air couch . If you’re very tall or plan to use your air lounger to hold a lot of weight, the Gaduge is the toughest one we reviewed and it has a lifetime warranty. Here’s a quick summary of the best points of each air chair. We hoped we helped you find the perfect air lounger today. If you still can’t decide, get two! They also make great holiday gifts. Check back soon for reviews of the most exciting tech gadgets on the market today. Has anyone tried the new Lazybagger with the USA Flag design, I’m looking at getting some for 4th July. I found them on Amazon but hey have no reviews yet?